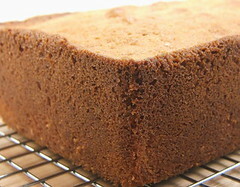 It’s April Fool’s Day … but I am not fooling around when I tell you that this pound cake is about the best I have ever had. I had half a bag of coconut sitting in my pantry since I made my Carrot Coconut Cupcakes and I didn’t know what to do with it. 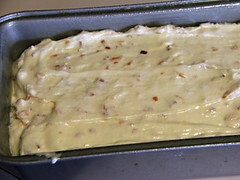 For a while I considered making coconut candy, but I was not in the candy making mood. As much as I enjoy candy, I prefer eating it to making it. So, it was back to the drawing board. 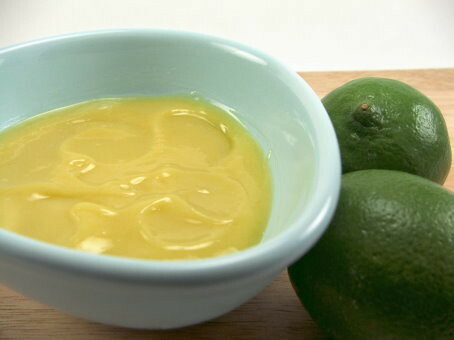 I also had a glut of limes that I needed to use, and lime curd seemed just the thing to make. 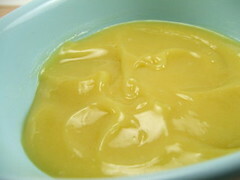 Well, If you have curd you need something to spread it on, and I love lime and lemon curd on pound cake. 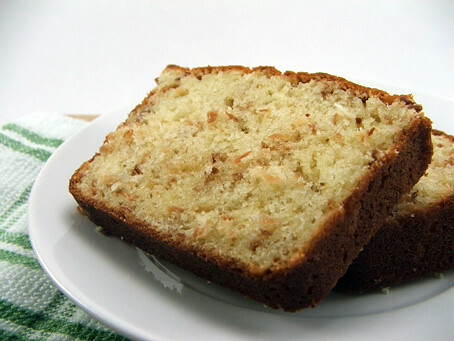 Why not, I thought, make a coconut pound cake? So, I did, and it was really, really tasty. 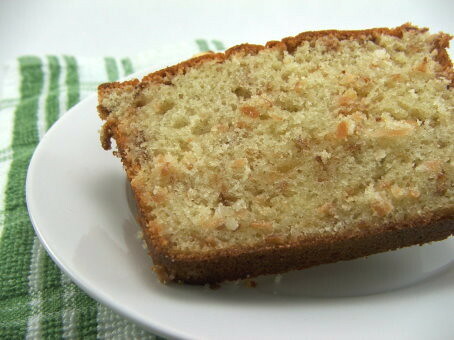 The toasted flavor of the coconut added another layer of flavor to the buttery cake. It also added a lovely texture to the cake. There was the fluffy part, the nutty crusty part, and now this chewy, sort of crispy part. It was, for me, the perfect way to welcome Spring! 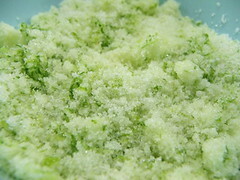 Rub the lime zest into the sugar until it is fragrant and the sugar is tinted pale green. Pour into a heavy bottom pot. 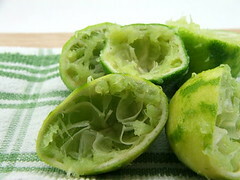 Juice the limes and add the juice to the pot with the sugar. Stir in the egg yolks and cook over medium heat until thick. Stir in the butter and cook until melted. Pour through a strainer into a heat proof bowl and cover with plastic wrap. Make sure to press the film down on the curd to avoid a skin. While the curd chills, make the cake. Heat the oven to 325 F and grease a 10″ loaf pan very well. Allow your butter, eggs and sour cream to come to room temperature. 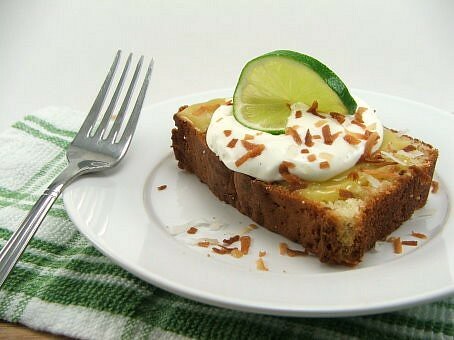 Toast the coconut for 10 minutes, or until brown and fragrant. Set aside to cool. 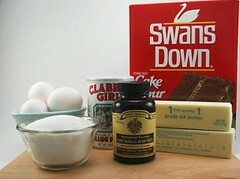 In a mixer with a paddle attachment, cream the butter and sugar on medium high speed for five minutes. Scrape the sides of the bowl down and add the eggs, one at a time, blending for one minute after each addition and scraping down before adding the next. Add the vanilla and blend to combine. 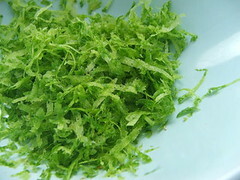 Sift the dry ingredients and add them, along with the sour cream, in three alternating installments, starting and ending with the dry ingredients. Do not over-mix. 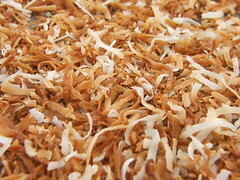 Fold the toasted coconut in gently and pour into the prepared loaf pan. 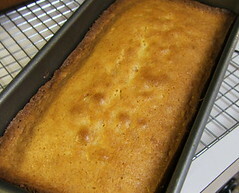 Bake for 60 minutes, or until the center of the cake springs back when lightly pressed in the center. You may need to tent the cake with foil to avoid over browning. Do not over-bake. Cool in the pan for 20 minutes before turning out onto a rack to cool completely. Slice and eat as is or …. 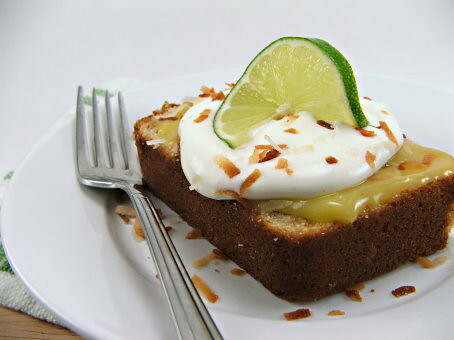 Spread a tablespoon of the lime curd over the cake, and while we are at it some softly whipped cream.